Maclean John Dorward, larger than life tobacconist and antiquarian bookseller in Kirkcaldy High St who died at the age of 60. Maclean John Dorward, the larger than life tobacconist at GT Coventry on Kirkcaldy’s High Street, has died suddenly at the age of 60. His death will mark the end of one of the country’s longest-surviving tobacconists which has been there since 1906. The “big man with a big heart” passed away last week in the Victoria Hospice after he was diagnosed with cancer just five weeks ago. And his younger sister Amelia –who he called Kern – told the Press he would leave a big hole in a lot of hearts. Born in Kirkcaldy in 1956, by the time Maclean was of school age, the family had moved to Bermuda via Hong Kong with his father’s work – he was employed by Cable and Wireless – and the family spent three years there. 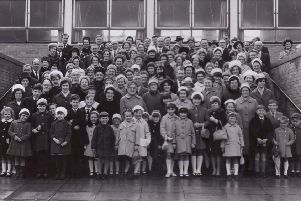 They returned to Kirkcaldy where he went to Dunnikier Primary before going to George Watson’s in Edinburgh. He studied catering at Napier College and had various jobs at restaurants and bars in the capital, including Deacon Brodie’s and the Overseas Club, where he was catering manager. The family took over The Friar restaurant in Perth, where Maclean was chef and Amelia did front of house. Although they loved the work and had a lot of fun, their quality of life suffered and Maclean moved into food science, completing post graduate studies in food technology and working in Grimsby and Norwich before coming back to Queen Margaret College in Edinburgh. He went on to try various jobs, with another post grad course at St Andrews, and a spell as a landscape gardener. His interest in tobacco led him to buy Coventry’s tobacconists in 2002 and he combined this with his love of books by adding a second hand and antiquarian book section to the shop. He developed the business over the next 14 years, drawing customers from all over Scotland as well as overseas. Many Americans bought their Cuban cigars from him, and many of his customers became friends. Amelia explained: “He was quite a reserved man, but was a loyal friend when he got to know people. He didn’t suffer fools gladly and some people just didn’t get him. “He was extremely knowledgeable about everything that interested him and studied his subjects in depth. He loved reading and films and was a member of film clubs. He did wood carving and made the sign outside his shop, and he loved going to restaurants. A celebration of Maclean’s life will take place at Crosbie Matthew funeral directors in Nicol Street Kirkcaldy on Tuesday, November 1 at 2pm.